During the 22-year war between Lord’s Resistance Army rebels and the government in Uganda, both the state military and rebels abducted civilians and killed them far from their homes. 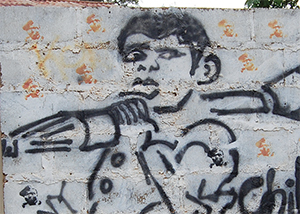 Despite a 2006 ceasefire, the conflict left bitter legacies of violence, trauma, and displacement for survivors. Since 2012, faculty and students in the Disasters, Displacement, and Human Rights (DDHR) program in the Department of Anthropology at UT have worked with survivors in Acholiland to understand the spiritual, political, economic, social, and legal dimensions of these improper burials. 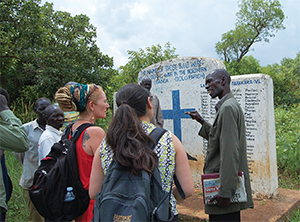 “Spirits of the Dead and Transitional Justice in Northern Uganda” is a multi-year team project led by Tricia Hepner, associate professor, and Professor Dawnie Steadman, in collaboration with UT alumna Jaymelee Kim and graduate students Julia Hanebrink, Hugh Tuller, Wilfred Komakech, and Lucia Elgerud, with the indispensable support of Acholi colleagues Joshua Oballim Jr., Jeffrey Opiyo, Godfrey Okot, Willy Okeny, and Deo Komakech. The intensive ethnographic research of the DDHR team informs potential forensic and archaeological investigations. The first task is to understand the implications of the graves and possible solutions from the perspective of the survivors. A related question is how archaeological excavation and identification could aid survivors. The third task is to survey and map the sites of atrocities in specific communities – from pit latrine mass graves to individual displacement camp burials. The scale and complexity is staggering. Bones are everywhere, and most survivors do not know where their abducted kin might be located. Since most people are unfamiliar with forensic science, the DDHR team has worked with chiefs, elders, and families to teach them the basics of forensic investigation.